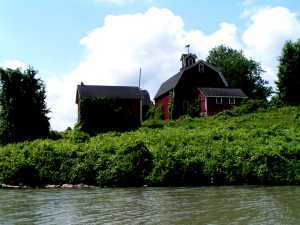 --- -We cruised the last few miles of the Cayuga-Seneca Canal , northerly through the Montezuma marsh, to the junction with the Erie Canal. 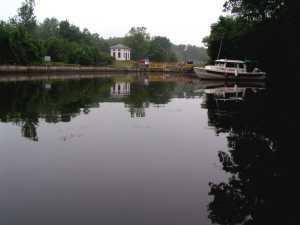 It was evening and storms were forecast , so we decided to head a few miles westerly to anchor below Lock 25. We tethered our bow to a swinging rope, used by kids to swing into the water. We dropped a stern hook to hold us from swinging into shore. 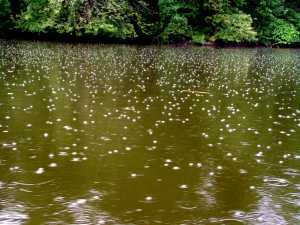 Soon, spatters broke the water surface around us. Tomorrow we must make our decision -- east or west? In the gathering darkness beneath the hiss of rain on our cabin roof, we discussed the virtues of each direction and then made our choice - west. 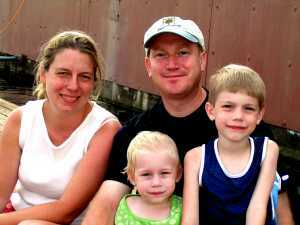 We had traveled on the eastern section of the Erie with our family many years ago when we lived aboard a 20-foot sailboat. Now we wanted to explore new water. --- -That night we tested the knot-tying ability of kids in the lock 25 area. The storm arrived with violent gusts of wind. Trees swayed, sheets of rain lashed the boat, and she swung on that kid 'swinging' rope. 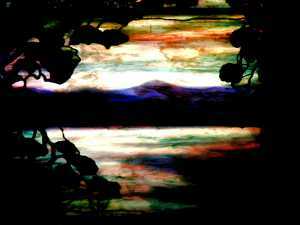 Through the flashes of lightning blasting the darkness, we could see our visual 'fix' on the shore was staying steady. Soon we slipped into the v-berth with the patter of rain on the hatch and the rocking of the boat from wind waves. Nowhere does the meaning of snug quite mean the same as within the warmth of the v-berth on a windy, stormy night tugging on the anchor rode in a secure holding ground. 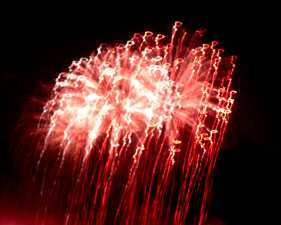 --- -Dawn came, as it often does after a violent frontal storm, with a stiff north wind and crackling clear visibility. Wanderer still swung on her bow anchor and stern line affixed ashore. 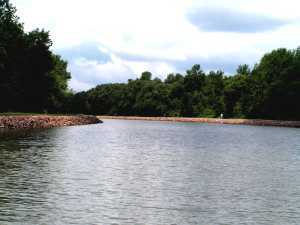 The natural watercourses utilized by the construction crews of the Erie Canal sounded more scenic to them, and they decided to travel easterly. We remembered the lines of the Richard Hovey poem ... "You to the left and I to the right, for the ways of men must sever; And it well may be for a day and a night, and it well may be forever." After breakfast, we bid them a bon voyage and we turned sterns to. --- -- -We were gently lifted up the lock and soon were on our way westerly through beautiful wild country that gave the impression of wilderness. 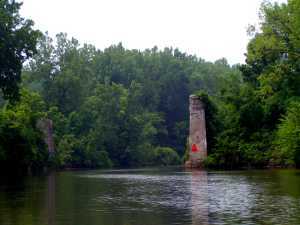 The presence of the towboat Joe and his attendant barge reminded us that this was once indeed America's main highway of commerce, as did the ruins of bridge abutments long since abandoned. 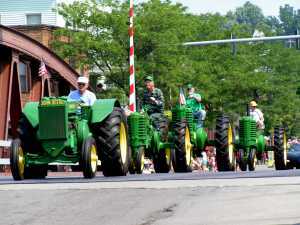 --- -- -Newark is a special town. It must be, for those of us with wanderlust rarely spend three nights in one town. 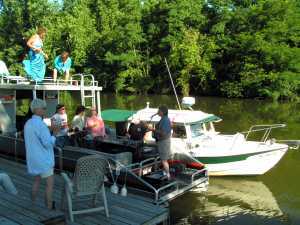 The town dock has excellent facilities, a floating dock, and friendly folks. The town has some nice restaurants, easy shopping, and a quiet ambiance. We quickly adopted the slow pace of the canal into our cruising lifestyle. 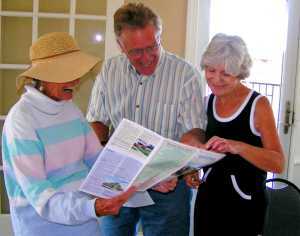 Plenty of time to walk the towns, check out the library, meet local folks and generally kick back into a vacationing mode. 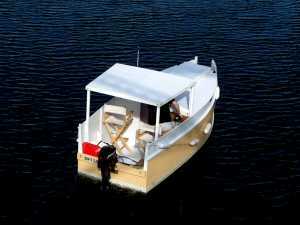 We have found that many cruising areas, because of their size and the immensity of water, are best measured in miles. Here, on the Erie, with charming towns, interesting history, good facilities, we measure our cruising in smiles. --- -- -We ate breakfast at the local diner and chatted with the waitress. A young man in a nearby booth overheard our conversation. 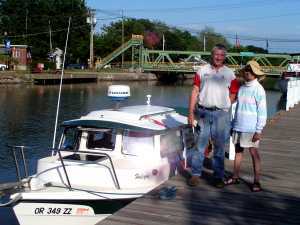 He is also a boater and that evening, Dan and his friend Jill arrived on their pontoon boat at the town dock and we shared sundowners. Dan has a band and they invited us to join a party the next day, and we did. We cruised westerly on the canal until we heard music and spotted their boat. They invited us to tie off to the party barge. What a great band and good folks. --- -- -Almost on cue, a rental canal boat came down the river, as though it was a spirit from the past cruising by to enjoy the entertainment. My memory drifted back to days when wandering minstrels played music to passengers of packet boats at locks in the evening. 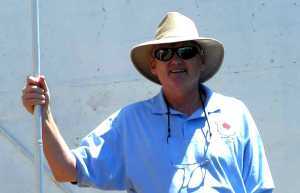 --- -- -As the sun sank low over the canal, and the music drifted delightfully on the light evening breeze, we untied from the party and slipped into a back channel for an overnight anchorage. 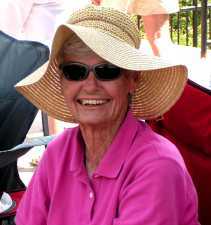 We had experienced two of the best aspects of cruising, for us. A wonderful evening with good people and a quiet sundown surrounded by the natural world. 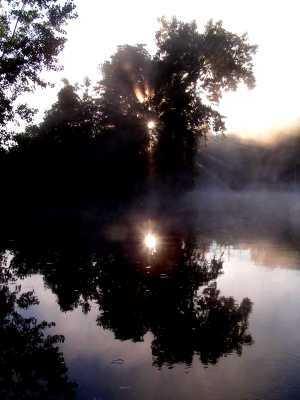 The next morning, dawn broke through a twisting mist rising off the cove. 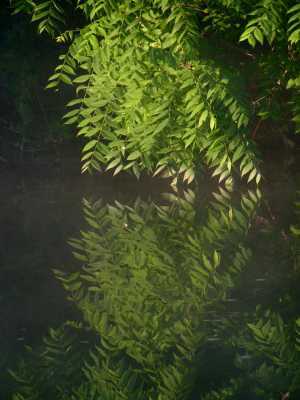 --- -- -We had brought some nice thick books to read during rainy days on the canal, but found we had hardly opened a page - except for being too hot and humid in the afternoons, for our taste, it was perfect summer weather. El 'rode' the bow often to have an unobstructed view of the scenery. 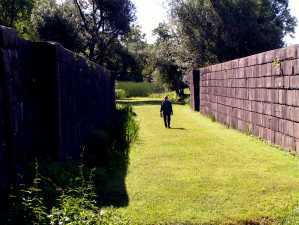 We stopped at old Lock 60 and inspected the rockwork of the original Erie Canal locks. We could literally walk through and touch history. 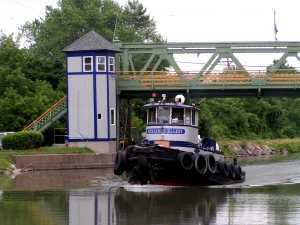 "Queen of the Erie Canal"
--- -A short cruise west of Newark and you arrive at the town docks of Palmyra, a charming town with beautiful Victorian architecture. One intersection, on the west end of town, is in Ripley's Believe It Or Not!. There are four churches, one on each corner. Locals say it is an "in-spire-ational" sight. The second floor of the 1867 Village Hall was once an Opera House for the community. 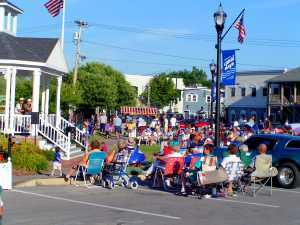 --- -A stroll up Market Street to town from the dock, at the Port of Palmyra, will bring you to a complex of four unique museums: the Palmyra Historical Museum (Once the Old St. James Hotel and Tavern); The William Phelps General Store; the Print Shop Museum; and the Alling Coverlet Museum. 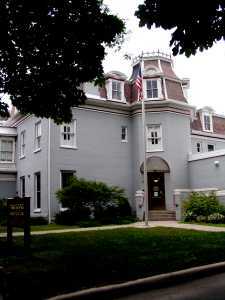 This museum houses America's largest collection of hand-woven coverlets, as well as a quilt room and displays of looms. --- -In 1820, Joseph Smith reported a vision of God near his home in Palmyra. Thus began the Mormon Church. There are many Mormon historical sites in the area, including an outdoor pageant at the hill Cumorah. This production takes place on an enormous ten-level stage, with twelve-tower lighting, a state-of-the-art sound system, Hollywood special effects, and a costumed cast of over 650. The show depicts Smith's story of the history of the native people of North America -- a tale contrasting significantly from that determined by archeologists. 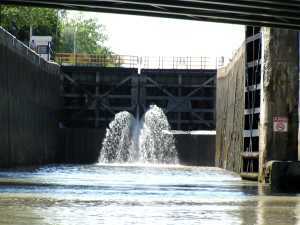 --- -Fairport bills itself "Crown Jewel of the Erie Canal." 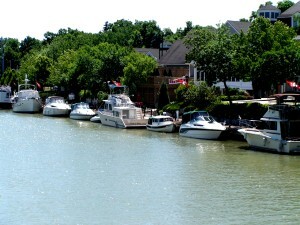 Once a commercial dock, today the town dock hosts pleasure boats cruising the canal. 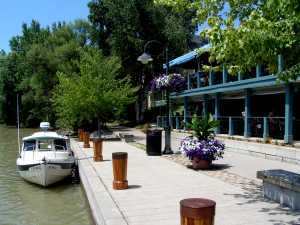 The excellent town library, many restaurants, and downtown stores are all a short stroll from the dock. A very short walk from the dock is an essential shop, named "Lickety Splits." The town claim of "front-porch friendly" certainly was true for us, where local folks would stop by on an evening stroll of the dock to chat and one fellow photographed Halcyon from every angle and the next evening dropped a small album of his photos into our cockpit. 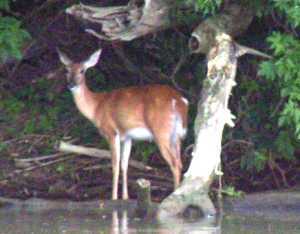 --- A local chap came by our dock toting a folding chair. 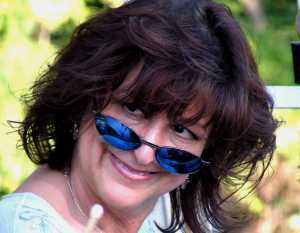 "What's up? ", El asked. 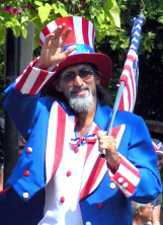 --- -"Why the Fourth of July Parade, of course. Bring your chair now and get the best seat." --- -So we did bring our chairs, and he was right. It was a hot day, and we could set up along the curb in the shade. 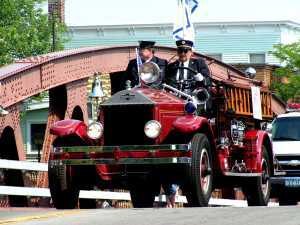 A Fourth of July Parade in Fairport is the quintessence of America. 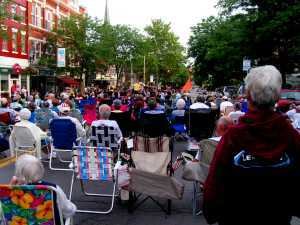 --- -We had such a good time in Fairport, that we were finding, once again, that the towns along the Erie Canal could hold us wayfarers like sticky glue -- and we loved our three nights in town. However reluctantly, we untied the lines and continued westerly. 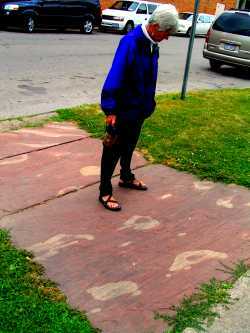 Our voyage was almost terminated when we suddenly encountered the Erie Monster. 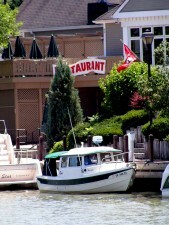 --- -Our lunch stop was at a nice restaurant right on the canal in Pittsford. We could watch college crew practicing and enjoy some air conditioning on a hot July day. There was a natural air cooling system inside some of the locks. --- -We traveled by the city of Rochester without ever feeling its presence. We were immersed in woods and surrounded by the rock-cuts blasted through the resisting limestone. --- -There was no evidence of the agriculture that once was so prevalent that it earned Rochester the appellation "Flour Capital of the World." The city then produced more flour than anywhere else on Earth. The quality was so good, that Queen Victoria stocked the royal palace with Rochester flour because she believed it was the world's best for cake-making. 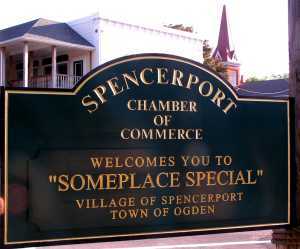 --- -It's easy for a town to proclaim that they are "someplace special," but what makes that claim reality are the folks who live and work there. 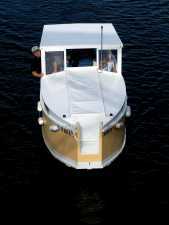 This bridge tender/dockmaster is someone special. 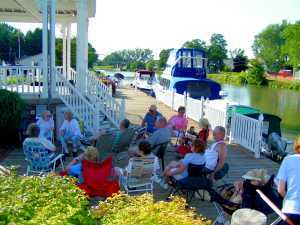 --- -On our return trip easterly, folks tied at the dock in Spencerport spoke highly of a musical group coming the next evening. "You must stay. They are really outstanding. 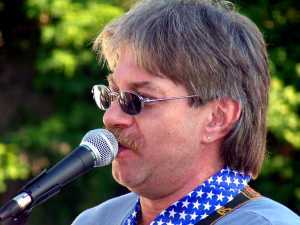 No one can do Irish songs like they do." 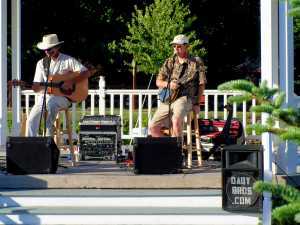 We happened to mention to folks we met way down on the Chesapeake, that the Dady Brothers were playing in Spencerport. "Oh, they are Terry's favorite music group. Stay." --- -With such recommendations, and even a command, we decided to stay -- and that was a good decision. They are great! --- -Reading newspapers, or watching the news on television, one has a very different understanding of life in early 21st century America than what one finds in reality. Murders, mayhem, cruelty, child and spousal abuse - they all rank front page reporting. Yet, the last time that I checked the statistics, America is a safer place than in my childhood - when as kids we played on the streets, wwalked to school, and took a bus to the movies downtown at night. 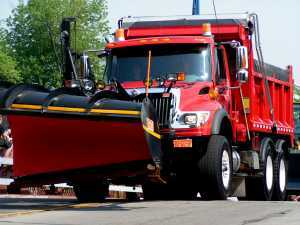 - - Here in Brockport, we witness the fact that the sensationalist papers and sound bites on evening news have little to do with the norm of American life. Here kids are out playing on the streets, riding bikes along the canal, and folks walk the streets of town after dark. 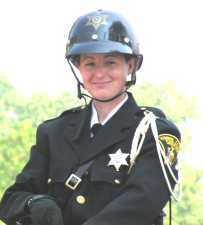 I'm sure there's some crime, of course, but this is the real America. A chap offered us his house on Block Island for a stay this fall when his family won't be there. Another chap here took us on a tour of the town. 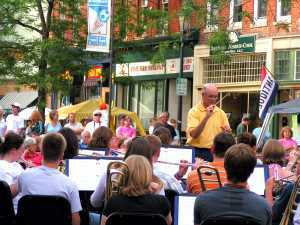 They closed off the main street of town one evening so the High School Band could perform for the town. America is beautiful. 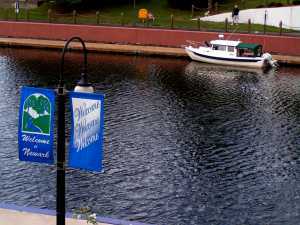 - - - - We suggest it is important to take time ashore visiting the towns on the canal to reinstate your faith in our wonderful country. Hmmm, 'take' time - an interesting expression - as though one can possess that piece of time, and perhaps, in a sense, that's exactly what we're talking about. So, if you 'have' some time, 'take' a little and wander through small town America when traversing the canal. The speed limit in the canal is a maximum of 10 mph through most of these western stretches, so this is life in the slow lane. 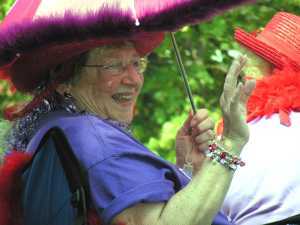 - - - - Anyway, we 'took' some time and 'took' a walk through the village of Brockport. 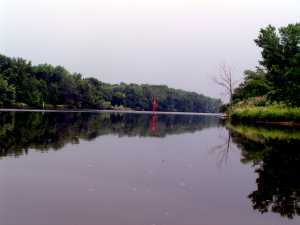 We began at the dock, where we had tied off Halcyon, along the bank of Erie Canal. 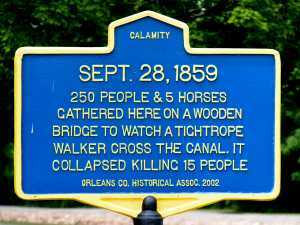 Brockport's history begins with that of the Erie Canal. A road was cut through the forested wilderness of Upstate New York in 1802. A few pioneers cleared the land for farms. 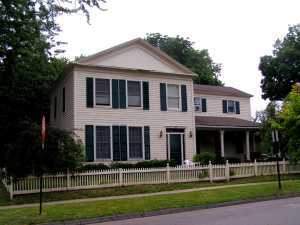 In 1820, when the Erie Canal was first laid out, Brockport became a village. 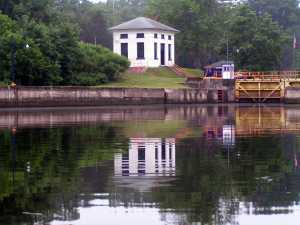 It was the western terminus for the canal for two years, before completion in 1825. This was the first means of mass transportation into the American west and opened the region for settlement and industry. After the canal reached the new town, it grew rapidly as industries developed, using the canal to transport goods to the outside world. Products as diverse as pianos, and paper boxes, vinegar and cleaning powder were manufactured here. - - - - Railroads spelled doom for canal traffic. 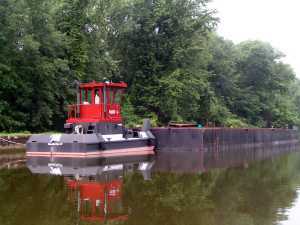 They could carry passengers and bulk freight in a fraction of the time required for barges. Commercial barging ceased almost totally about 1970. 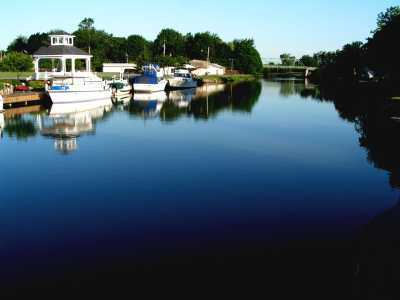 The canal was then used primarily by pleasure boats, and the condition of the locks and canal slowly deteriorated. 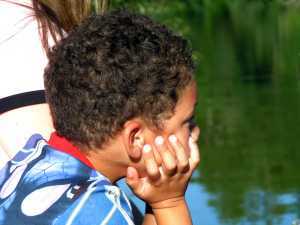 Since 1991, the New York State Canal Corporation has been transforming the canal into a recreational and tourist resource. 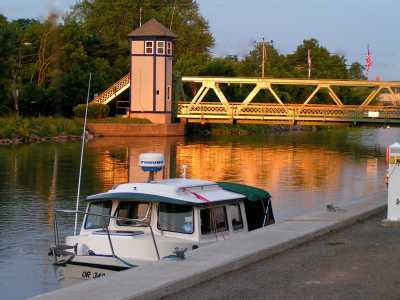 - - - - There are two lift bridges in Brockport, 900 feet apart, built in 1913 during the last reconstruction of the canal. One lock master zips between the two bridges. 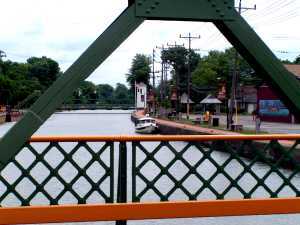 They are two of the remaining sixteen lift bridges on the canal. - - - - The first of several educational institutions was founded in 1834 and evolved into today's SUNY Brockport. 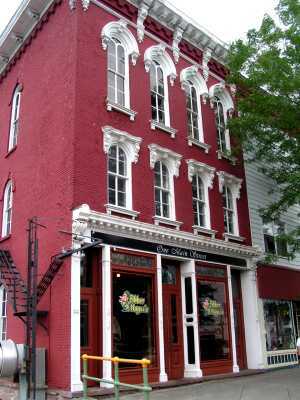 - - This Victorian building is one of seven toll houses on the original Erie canal, and sits beside the canal next to the main street and draw bridge in town. Check out those lintels!! A lintel is a wood (in this case) or stone beam across the top of an opening, such as that of a window or door or fireplace. The lintel atop the first floor is different from the window lintels on the second floor and they are different than those on the third floor. Neat! The first floor lintel is 'supported' by cast iron pilasters (those white vertical 'columns' that project slightly from the front wall and have a base, shaft and a capital atop). Such a pleasing decorative whole (imagine a wedding cake in those 'fussy' late 19th century Victorian times). The cornices and supporting brackets, of the overhanging roof, look like a cake decoration. A real beaut! - - - - This structure dominates a downtown corner of town. It is a fascinating and distinctive classical Victorian building. There is a pleasing contrast of brick and stone, with arched stone lintels and arched structures throughout the façade. One of the unique aspects of this building, and one that reflects the foresight of the town fathers, can only be seen on the side of the building. The sign has been restored. 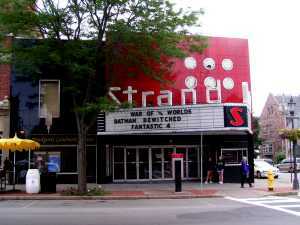 - - - - The Strand movie theater, built in 1916, is the oldest in the Rochester area. 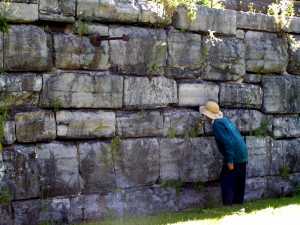 It was originally faced with a local brown sandstone. In 1946, it was given a Streamline Moderne façade, with black Carrara glass on the first floor. The Strand anchors this corner in town with a touch of classy modernity. 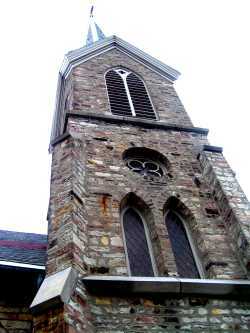 - - - - One of the most beautiful and interesting structures in town is St.Luke's Episcopal church. 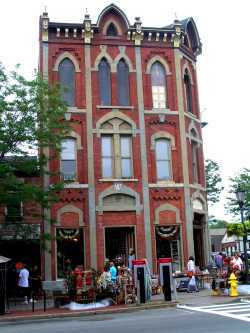 This is a Gothic Revival building dating from 1854. 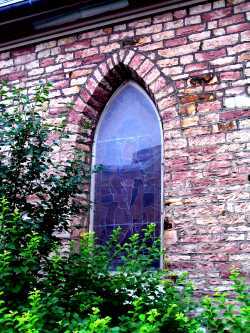 It is dressed in the local Medina Sandstone, with limestone highlights. - - - - You should also visit the interior of St. Luke's to appreciate the stained glass windows, two of them original multichromatic Tiffany windows. 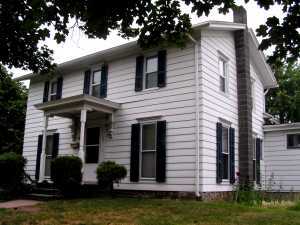 --- -There are some fine examples of Federal style homes in the residential area of Brockport. 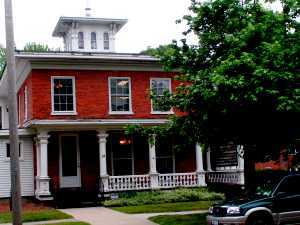 One home was built in the 1820's for William Seymour, a builder of McCormick reapers. Another, was built in the late 1820's for Hiel Brockway, world's largest builder of canal packet boats, and the owner of a packet line between Rochester and Buffalo. --- -Italianate homes, with elaborate cupolas atop the roof and ornate woodwork around the porches, were built later in the town's history. --- -The Second Empire Style became a popular architectural style in the 1860's. The building to the left, below, was also built for William Seymour in the Federal Style early in the 1820's, but remodeled into the Second Empire Style in 1865. 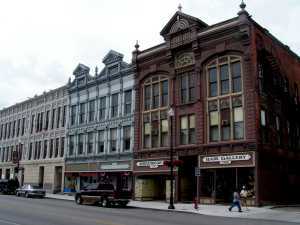 The building on the right, below, was constructed in 1860. 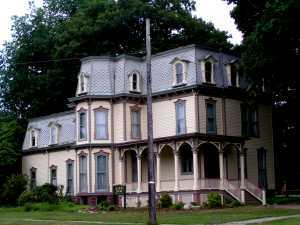 It demonstrates the intricate woodwork and mansard roof typical of the Second Empire. --- -We decided to make Albion our westernmost port-of-call ;since summer temperatures and humidity were becoming excessive for us. A record-setting July was too much, even for us Nevadans. We found some of the same beautiful architecture in Albion as Brockport, but perhaps less economic vitality in the community to support the utilization and preservation of the old structures. 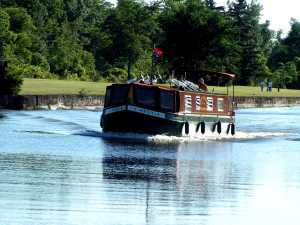 --- -It is difficult to imagine a more relaxing or enjoyable way to 'spend' a month or so than cruising the Erie Canal. This is a cruise for the palate, the eye, the ear, for nature, for history, for learning, for sharing,for education, and just plain enjoying. It is a cruise for the soul.